It’s no coincidence that Barcelona travel usually includes platefuls of seafood. The Catalán capital city lounges alongside the Mediterranean Sea, and where there is sea there is bound to be an abundance of seafood ready to delight the palates of visitors. As we like to do on our Barcelona blog, we’re going to give you an insider’s look at three different styles of squid you can find in Barcelona’s bars and restaurants. By the end of the post, you’ll be able to saddle up to one of Barcelona’s many dusty bars and order your calamares with confidence! Calamari is just a fancy way of saying “squid”. Nobody really likes the word “squid”, do they? Calamari or squid…the terminology matters not; when you come to Barcelona, be prepared to dive into a deliciously deep-fried or beautifully breaded world of calamari. 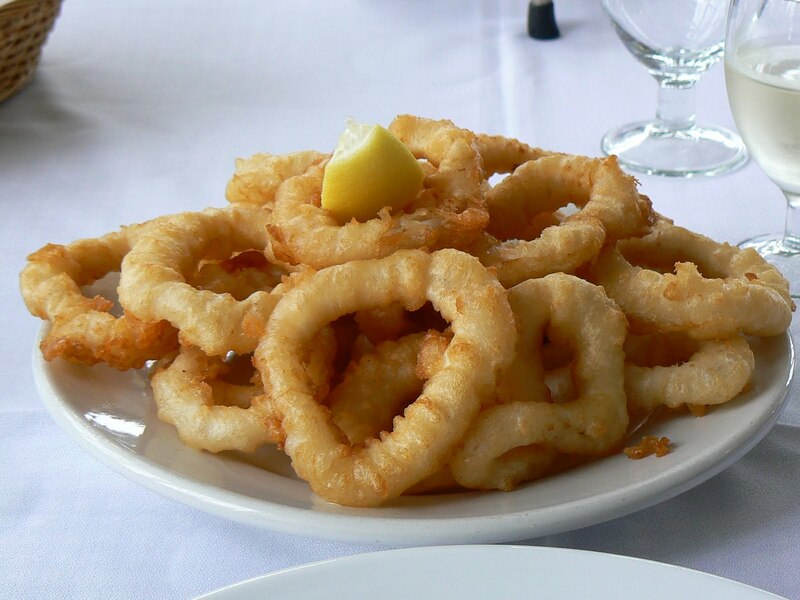 Calamari typically comes in one of three ways fried: a la romana, a la andalusia or chipirones. 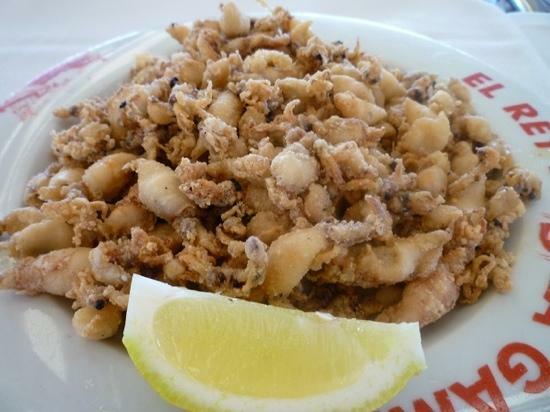 Calamares a la romana are rings of squid dipped in batter and fried until they are golden brown. They’re pulled out of the oil, dried and set on a plate with (usually) a swarthy slice of lemon. A slight crunch will welcome you as your teeth bite through the crispy exterior of the rings in the same way you’d get a nice crackle biting into a batter-dipped onion ring. A la romana is a great way for timid eaters to enter into the world of Spanish cuisine. Simple. Tasty. Innocuous appearance. Calamres a la andaluza, however, is a different matter. Innocuous they are not. This dish features something you won’t find on your plate of a la romana: whole, small squid. That’s right…not one small squid, but several small squid. Many times your plate of a la andaluza will arrive at your table with three or four whole squids lurking among the rings you’ve so happily ordered. You’ll also note calamares a la andalusia are breaded and don’t have the same style of crunch which you’d find in a la romana. This textural difference points a big difference between the two styles of squid: a la romana are cooked in a wet flour batter while a la andaluza are cooked in a dry flour coating. These little bits of squid also come with a slice of lemon. The dish is named after Andalusia, the southern region of Spain from where this type of squid preparation originates. If you’ve had a la romana and you want to step up your adventure-eating game, order a plate of calamares a la andaluza. Say goodbye to mere rings of squid. Chipirones is a calamri lover’s paradise on a plate. This classic dish combines two elements from a la romana and a la andaluza: a golden brown cook and heaps of whole squid. Before you run for the nearest Burger King to comfort your scared stomach into a glorious coma of Whoppers and fries, remember that chipirones, when prepared right, can be one of the most amazing food experiences you’ll have in Barcelona. Whereas calamres a la romana and a la andaluza are often cooked using frozen product, chipirones tend to be cooked using fresh, small squid. Battered rings, breaded rings or whole fried calamares — which one do you prefer?